This authoritative text provides a detailed insight into how construction companies manage their finances at both corporate and project level. It will guide students and practitioners through the complexities of the financial reporting of construction projects within the constraints of accepted accounting practice. The book is written for non-accountants and from a contractor’s perspective and is equally relevant to subcontractors and main contractors. The authors examine the relationship between the external annual accounts and the internal cost-value reconciliation process. CVR is covered in depth and the authors consider issues such as interim payments, subcontract accounts, contractual claims, final accounts, cash flow management and the reporting of the physical and financial progress of contracts. A broad perspective of all the financial aspects of contracting is taken along with related legal issues and the authors explain how things operate in the ‘real world’. They describe good practice in financial control while at the same time being honest about some of the more questionable practices that can - and do - happen. The approach taken is unique as the financial management of construction projects is considered from the perspective of the contractor’s quantity surveyor. The book deals with the real issues that surveyors have to address when using their judgment to report turnover, profitability, cash flow, and work in progress on projects and the financial problems faced by subcontractors are frankly and pragmatically explored. The payment and notice requirements of the Construction Act are explained in detail and relevant provisions of JCT2011, NEC3, ICC, DOM/1 and other standard contracts and subcontracts are also covered. Financial Management in Construction Contracting addresses the wide variety of external factors that influence how construction companies operate, including government policy, banking covenants and the financial aspects of supply chain management. Cost reporting systems are described and real-life examples are used to illustrate cost reports, accrual systems and how computerised systems can be employed to provide the QS with information that can be audited. Examples drawn from practice demonstrate how work-in-progress (WIP) is reported in contracting. Cost value reconciliation reports are featured and the book demonstrates how adjustments are made for overmeasure, undermeasure, subcontract liabilities and WIP as well as explaining the processes that contractors use when analysing external valuations. This is the ideal core text for final year degree and post-graduate level modules on Quantity Surveying, Commercial Management, Construction Management and Project Management courses and will provide an invaluable source of reference for quantity surveyors and others who may be engaged in the financial management of construction projects. Andrew Ross is Head of Postgraduate Programmes in the School of the Built Environment, Liverpool John Moores University. He teaches construction project financial management to undergraduate and post graduate students and has successfully supervised many PhD students as well as acting as external examiner to numerous UK and overseas Universities for undergraduate, postgraduate and research degree courses. Peter Williams is a Consultant and Lecturer with extensive practical experience in building, civil engineering and surveying. Formerly a chartered builder, chartered quantity surveyor and principal lecturer, he is now a writer, researcher, lecturer and consultant with particular interests in contracts and finance, delay analysis and health and safety management. Hi guys, thought I would share some thought provoking and agenda stimulating reading I have recently come across. 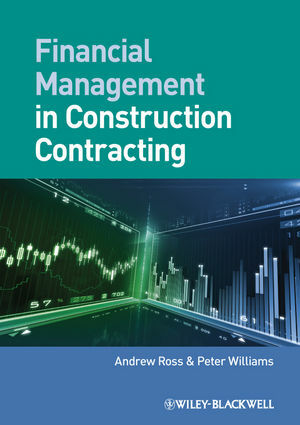 The book is entitled “Financial Management in Constructing Contracting” by Andrew Ross & Peter Williams, but could easily have been called “The Constructor’s Almanac” or “Wisdens Construction Guide“. If you want the “inside line” on construction know how, this book covers it all. From an understated promise to “explain how the financial position on construction contracts is reported” the book expands into every conceivable avenue the authors could explore in their quest to open up, explain, walk through and map, the processes that guide the industry and control the business operation of a construction company, from finance to bidding, managing risk to delivery, and every stop in between. If you are a student, the early chapters on finance, accounting, contracts and procurement, will set out the basics of the industry in straightforward language, lots of good worked examples and clearly labelled diagrams. The later chapters address the subtleties of cash management, budget control, risk and opportunity management, progress monitoring, valuations and cost/value reconciliations, in far deeper detail and with contemporary work sheets to guide you through and explain the complexities of reporting cost and value in equal proportion. The authors have extensive practical experience of the industry, both having risen from the shop floor to the lecture theatre, are suitably qualified to add insight to knowledge and have managed to capture in many ways the essence of the industry, its conflicts, collaborations, power plays and team working. And if you are of the social networking generation there is even a website on which to hone your new found skills. Fully interactive, it provides detailed worksheets and schedules to further explain the lessons contained in the printed version.